The latest Star Wars spectacular comes from the big screen to the comic page! The blockbuster film of 2016 becomes the incredible comics adaptation of 2017 when ROGUE ONE hits the shelves as a six-issue limited series beginning in April written by Jody Houser and illustrated by Emilio Laiso. We’ve got all the available intel on the series right here in this interview with Houser and Laiso, so strap in and get ready for excitement as only Star Wars can provide! Marvel.com: Jody, heading into an adaptation of a film, what’s important for you to plan for, and to deliver? Jody Houser: I’ve worked on several comic adaptations now, and the most important aspect for me is to make sure the version of the story I’m telling works for the medium, rather than trying to tell a screenplay in the pages of a comic book. Obviously you want to do your best to capture what people loved about the movie and to bring new elements to the story. But first and foremost, you want to make a good comic. Marvel.com: As a storyteller, what are the themes and ideas in ROGUE ONE that pump you up the most? Jody Houser: Getting to work on Star Wars in itself is a huge, huge deal for me! As for ROGUE ONE specifically, I like that it focuses on the more ordinary characters, those who choose to become heroes rather than being born to it. The choices that characters make in the face of evil and corruption is something we can relate to even though we’ll never get to swing a real lightsaber. Marvel.com: Which characters from the film really stand out for you the most? Jody Houser: I really enjoyed all of the characters, but if I had to pick one favorite at blaster point, it would be Bodhi Rook. He’s the only one in the movie who would have probably been perfectly safe taking no action at all. But he chose to leave the safety and security of the Empire because it was the right thing to do. His arc was probably the most emotional for me. Marvel.com: We hear there may be extra story material in the comic that wasn’t in the film; how do you create moments like that? Where do you look for areas that can be expanded upon? Jody Houser: [Director] Gareth Edwards and Lucasfilm had a number of ideas for moments that didn’t fit in the film that I’m working with. There are also some amazing moments in the novelization I want to incorporate. So it’s really a mix of material from existing versions of the story, as well as new scenes. Marvel.com: What’s the process been like on this? Do you have the film script next to you? Do you watch the film several times over? Jody Houser: I actually read the “Rogue One” script in the Lucasfilm offices, which was a little surreal. While I wasn’t able to have a copy at that point, I took extensive notes. I’ve seen the movie twice in theaters with friends and family—over 80 friends opening night, actually! I’m also working from the novelization and Ultimate Visual Guide that Lucasfilm sent over. Marvel.com: What will the collaboration with Emilio be like for you? What is he bringing to the project that you love? Jody Houser: We’re still early enough in the process that I haven’t worked directly with Emilio yet, but I’m looking forward to it! Emilio is great at chaotic action scenes, which is definitely a must for this story. I’m also excited to see his take on the cities and landscapes of the new worlds. Marvel.com: Emilio, you’re returning to the Star Wars universe with this project: how did you feel when you were offered the chance to go Rogue? Emilio Laiso: Returning to the Star Wars universe is exciting. The saga is very exciting thanks to the array of the worlds and of the races to become familiar with. Moreover, there are the characters in the saga, who have entered in the collective imagination. Characters to whom it must be payed respect, and also to pay respect the millions of fans. “Rogue One,” in the framework of this fantastic saga, is something unique. There are legendary characters in a legendary universe, and the movie, in my opinion, is something extraordinary. When [editor] Heather [Antos] told me that there would be the possibility to be the artist on ROGUE ONE, my first reaction was something like “wait… wait…”! I was very enthusiastic that she and [editor] Jordan [White] choose me for the adaptation. When I got the word, I was so happy that I spent a couple of hour bobbling the head of my Funko Stormtrooper telling him that it was a great honor and a great responsibility. Marvel.com: Visually, what draws your eye the most in the film? Which characters, ships, etc. really excite you to draw? Emilio Laiso: The space battle outside the shield is one of the aspects that has struck me more from a visual point of view. Indeed, this is one of the “Rogue One” scenes that I can’t wait to realize. I’m so excited to have the opportunity to work on every single new character, each of which has an excellent visual characterization. My personal favorite characters are Chirrut Imwe and Baze Malbus. Marvel.com: And what are you looking forward to in working with Jody? Emilio Laiso: This is my first time working with Jody, and I think that ROGUE ONE will be a great opportunity. I hope that together, adapting this epic movie, we will be able to make this series unique. 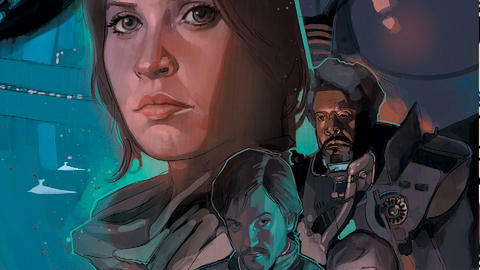 Jody Houser and Emilio Laiso journey to the stars with ROGUE ONE, beginning in April!